Riverstone Montessori Academy proudly serves students ages 2.5 through 15 with programs extending into High School and College Academics. When a child is potty-trained, he may be ready to start his education at Riverstone. Even if your child is a toddler, visit all of our program offerings and see how your future student can excel academically, socially and professionally at Riverstone Montessori Academy. We believe that our programs are the most academically advanced in the area and encourage parents to compare specific curriculum guidelines, admission requirements and outcomes. We offer speakers to address your parent, church or civic group on education, the Montessori philosophy and child development and learning. It is our goal to raise the education expectations in our community and improve academic outcomes for all students. Riverstone also provides information and discussion groups for stay-at-home moms or mothers of infant/toddlers on how to best prepare your home to meet the developmental needs of your child. Choose the program that you are interested in to learn more. 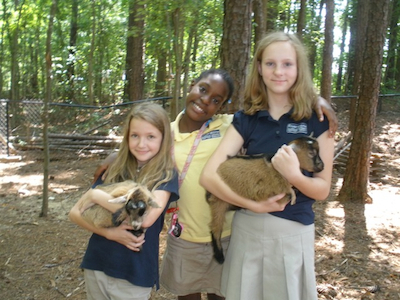 We also offer a wide variety of Enrichment Classes outside of our regular curriculum. These classes are for our currently enrolled students only. An environment for home-schooled or traditional students not challenged in private or public schools - Riverstone Montessori goes beyond textbook learning with exciting, hands-on field studies and collaborative learning. Students develop valuable leadership, planning and presentation skills to prepare for college and can accelerate their studies to begin working at a high school level. Our first Adolescent Program graduates, all having started Montessori in Primary, scored at college-level in all subject areas on placement tests for high school. Physically and emotionally, this can be a difficult period for children as they transition from the child of elementary to the adolescent and young adult. Dr. Montessori recognized that it was very important for a child at this stage to have a clear understanding and appreciation of their self-worth and ability to participate in society. The Montessori Adolescent Program combines the advanced study of academics with practical real-life experiences that help children enjoy learning. A student that enjoys school learns to value education which helps propel them to success in future academic environments. Practical experience is a hallmark of the AMI Adolescent Program. Students develop and run their own businesses which will incorporate their study of mathematics, language and professional studies. Avoiding the "why do we need to learn this" pitfall of traditional education, Riverstone Adolescent Program students enjoy hands-on experiences in business, science and social studies. 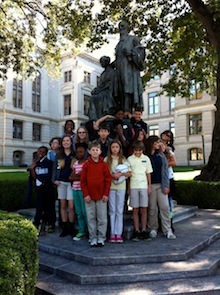 Our students may study our judicial system by following a trial in the courtroom from beginning to end. They explore chemistry, biology and environmental issues be becoming certified by the local government to monitor water quality and reporting the results. Completely in charge, students experience planning, budgeting and execution of business activities with student managers, student staff and actual customers. A monthly coffee house, planned, advertised and prepared by students with managers, serving staff and cooks. Planning and installing an organic garden after researching the process and working in existing gardens throughout the area. Field study travel to Crow Canyon in Colorado as a culmination to their geology studies. Visits to area businesses, utilities and governmental agencies to research and explore our government and market culture. The social aspect of this program is as important as the academic program in preparing students for high school and college. The Montessori program engages students in a manner that gives them actual responsibility and the tools to be a success. This level of responsibility creates a more engaged student who responds in a more mature and appropriate manner. While they are still adolescents who love to have fun, these busy students focus more on the exciting variety of tasks before them rather than on less appropriate social behaviors. They learn to lead meetings, hold planning sessions, participate in debates and interact with adult consumers in a business setting. Riverstone Montessori Adolescent Program prides itself on the positive impact it has on our local community. Throughout the year, our students reach out to those in need through fund-raising, food/clothing drives and many other activities. The day after the tornado swept through downtown Atlanta, our students were there assisting in the clean up for needy residents. Students in the Montessori Adolescent Program feel connected to the larger community, establish their sense of self-worth and have a meaningful educational experience that helps advance their studies and maintain their love of learning. Throughout this process, the student's individual needs and abilities guide their educational plan. Teachers meet with students one-on-one to give lessons, review progress and work to develop their portfolio for high school and college. Students working alone and in groups explore individual interests, provide academic support and help each other move forward academically. The scientific design of our curriculum easily addresses the needs of advanced and struggling students alike. Students can enjoy accelerated studies in biology, animal classification, anatomy/physiology, geometry, physics, chemistry, mathematics, literature and fine arts. These studies are designed to foster organization, leadership and presentation skills. 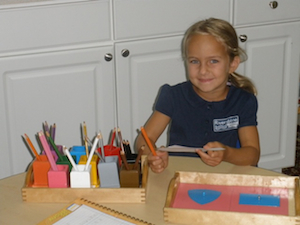 The elementary program builds on the advanced AMI Montessori Primary experience. This includes an integration of arts, sciences, geography, history, and language that engages the abstract interest of the elementary child and allows for multiple subjects to be taught in a single activity. As in the Primary Classrooms, the Montessori materials are a means to an end. They are intended to evoke the imagination, to aid students in understanding abstract concepts. The child works within a philosophical system asking questions about the origins of the universe, the nature of life, people and their differences, etc. Interdisciplinary studies combine geological, biological, and anthropological science in the study of natural history and world ecology. We introduce the formal scientific language of zoology, botany, anthropology, geography, geology, etc., exposing the child to accurate, organized information and respecting the child's intelligence and interests. Students have access to complete skeletal and anatomical models to learn about complex human biological systems as well as advanced animal and plant classification materials. The use and design of timelines, pictures, charts, and other visual aids provide an overview of the development and first principles of each discipline in human history. A mathematics curriculum presented with concrete materials that reveal arithmetic, geometric, and algebraic concepts allows students of varying degrees of ability to easily grasp complex ideas. We offer an emphasis on professional, open-ended research and in-depth study using primary and secondary sources (not originating from textbooks or worksheets), field studies and presentations. This approach mirrors research design for later college studies and prepares students to address advanced coursework. "Field Studies" make use of community resources beyond the four walls of the classroom. 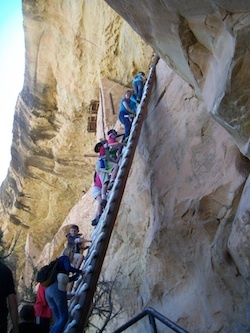 These studies and outings originate from the student's own interests. In 2008, the oldest elementary students traveled to New York to represent the Democratic Republic of the Congo at the Model United Nations Summit. The curriculum is connected across subject areas through the use of connective narratives called "The Great Lessons." Great Lessons span the history of the universe, from the formation of earth and its life forms, to the emergence of human cultures and the rise of civilizations. Aided by impressionistic charts and timelines, these lessons provide an overriding framework that allows students to see historical connections between different fields of study and better appreciate their usefulness. This helps students value learning and engages their innate curiosity for additional study. Studies are integrated not only in terms of subject matter but in terms of ethical learning, which results in appreciation and respect for life, moral empathy, a fundamental belief in progress, the contribution of the individual, the universality of the human condition, and the value of citizenship. The AMI Primary class instills the habits that make future education easy. This alone can change a child's future allowing them to move effortlessly into more and more advanced academics through their own sense of intellectual curiosity and wonder. This is one of the greatest gifts a parent can give a child. When a child is potty trained (often by 2.5) they have achieved a level of self control and independence that allows them to enter the Montessori Primary classroom. A Master's level trained teacher, combined with materials designed to engage a child's natural interest in learning, will allow young children to advance in their studies. This is not a daycare. 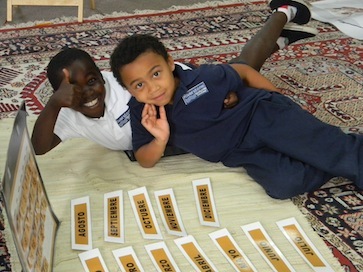 AMI Montessori Primary children receive instruction that can extend into the third grade of traditional education. Studies clearly illustrate that students who begin Montessori at this early age, and complete AMI Montessori Elementary, are academically and socially more advanced than their peers. 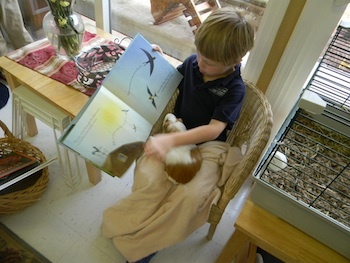 The AMI Montessori preschool classroom is a "living room" for children. Dr. Montessori was the first to introduce "child-sized" furnishings to the classroom environment. Children choose educational activities from the many scientifically designed, self-correcting materials displayed on open shelves and are allowed to work on the floor or at tables as they feel comfortable. People that believe the common misconception that younger children cannot concentrate without supervision have never been in an AMI Montessori classroom. Dr. Montessori demonstrated that younger children can easily and happily acquire skills that allow them to learn independently when provided with enticing, age-appropriate materials. Over a period of time, the classroom develops into a "normalized community". Students work independently with high levels of concentration and few interruptions. Normalization is the process whereby a child moves from being undisciplined to self-discipline, from disordered to ordered, from distracted to focused, through activities in the environment. 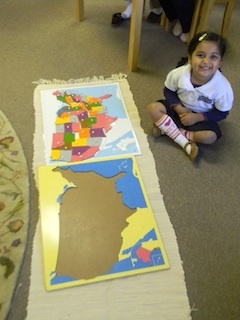 The process occurs through repeated work with materials that captivate the child's interest. Sensorial studies enable the child to order, classify and describe sensory impressions in relation to length, width, temperature, mass, color, pitch etc. 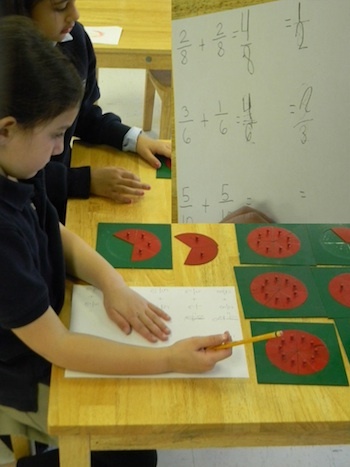 Mathematics makes use of manipulative materials to enable the child to internalize concepts of number, symbol, sequence, operations and memorization of basic facts. Students are introduced to numbers beyond a million and the beginnings of addition, subtraction, multiplication,division, decimals, fractions, geometry and more. Language includes oral language development, written expression, reading, the study of grammar, creative dramatics and children's literature. 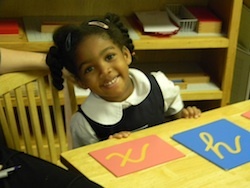 Unlike conventional education, Montessori students learn cursive writing, story development and reading simultaneously. This is accomplished through the use of sandpaper letters, alphabet cut-outs and various presentations allowing children to link sounds and letter symbols effortlessly and to express their thoughts through writing. Cultural activities expose the child to advanced terminology in geography, history and life sciences. Music, art and movement education are part of the integrated curriculum. The primary environment unifies the psycho-social, physical and academic functioning of the child. It is important to provide an early academic foundation that includes a positive attitude toward school, inner security and a sense of order, pride in the physical environment, abiding curiosity, a habit of concentration, habits of initiative and persistence, the ability to make decisions, self-discipline and a sense of responsibility to other members of the class, school and community.